Sometimes, all it takes is an ice cream sundae to chase the worries of the day away. We almost always had ice cream in my freezer growing up. 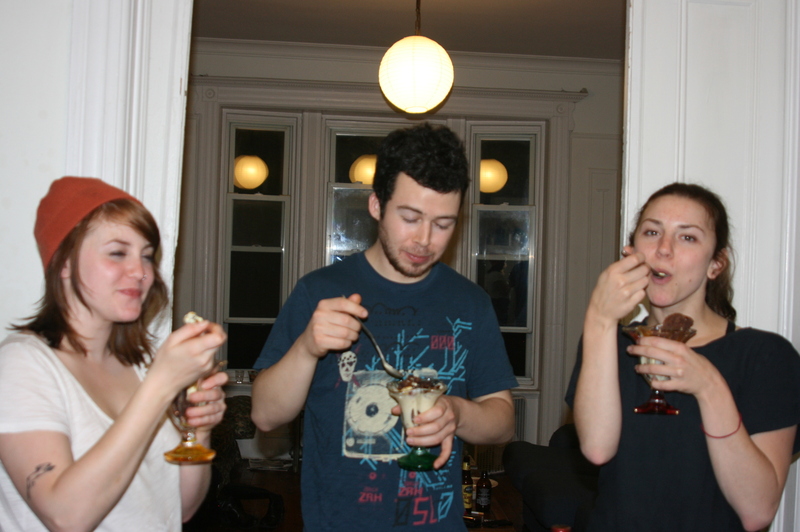 But, it was a special occasion when a banana was split, the Hershey’s syrup heated up, and chocolate jimmies doled out. That small bit of extra effort turned even store-brand Neapolitan into something magical. 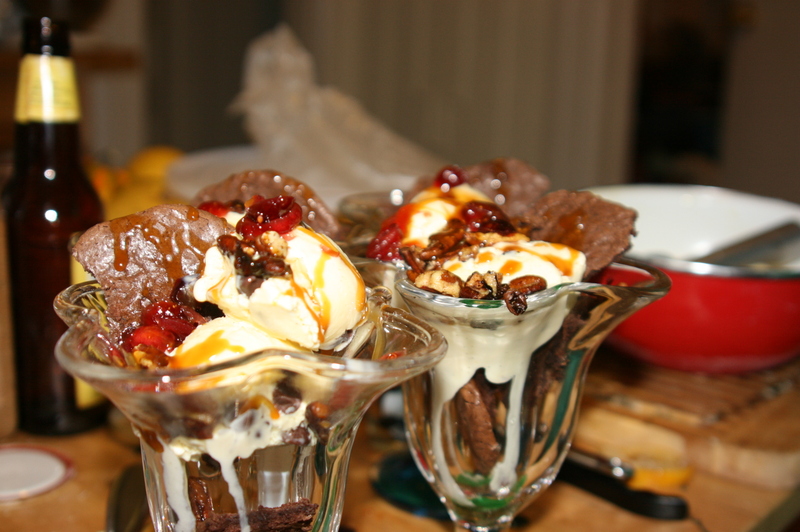 These sundaes are a bit over-the-top, a celebratory treat on one of summer’s first warm nights. I’ve included my vanilla-chocolate-chip ice cream recipe, but these toppings would go wonderfully onto good quality store-bought frozen dairy as well. Pour whiskey over cherries and let soak for 24 hours. Drain whiskey (or add to a Manhattan). In a dry skillet over medium heat, toast pecans until aromatic, about five minutes. Add honey, sugar, and salt to skillet. Toss to combine. Spread nuts onto a parchment-lined baking sheet and let cool. In a heavy-bottomed pot over medium-low heat, slowly dissolve sugar with a tablespoon or two of water. Continue cooking, stirring with a rubber spatula, until sugar reaches a deep amber color. Remove from heat and add butter, stirring to combine. Carefully add heavy cream (mixture will splatter and bubble so go slow and steadily) and stir to combine. Add salt and let cool to room temp. Caramel will keep in the fridge, covered, for about 3 weeks. Add two scoops of your favorite ice cream to bowl. Pour caramel sauce over ice cream (proportions at your discretion). Top with a handful of pecans, a few cherries, and a chocolate cookie. Serve immediately. Add cream and milk to a heavy-bottomed saucepan. Split vanilla bean and scrape seeds and pulp into the saucepan along with the pod. Bring cream to simmer. Meanwhile, combine egg yolks, sugar, and vanilla extract and whisk together. When cream begins to simmer, turn off heat and slowly add one cup of hot cream to the egg mixture, whisking constantly. Remove the vanilla bean pod from the cream and add egg mixture to pot. Heat gently, stirring often, until mixture has thickened to coat the back of a spoon. Remove from heat and strain into a large bowl. Let cool to room temperature and then cover and refrigerate overnight. Freeze in an ice cream maker according to manufacturer’s instructions. Add the chocolate chips in the last few minutes of churning. Transfer ice cream to a freezer-proof container with a lid and place wax paper or plastic wrap directly onto the surface. Cover with lid and freeze until solid.